He was the son of Virginie Sampeur (1839-1919), a highly regarded poet. Before her marriage to Ludovic's father, Sampeur was married to poet Oswald Durand, author of the Haitian Kreyol poem “Choucoune.” Lamothe's father, Tacite Lamothe, was a pianist, and his grandfather, Joseph Lamothe, was also a proficient instrumentalist. He studied the piano and clarinet at the Institution St. Louis de Gonzague, moving to Paris for study with Louis Diemer at the Conservatory. Educated at the Institution de Saint Louis de Gonzague in Port-au-Prince, Lamothe developed a reputation for technical facility on the piano and compositional prowess at an early age. Lamothe traveled to Paris in 1910 on a scholarship raised by German merchants residing in Haiti. In Paris, Lamothe studied with Louis Diémer at the Paris Conservatory and held a recital at the Cercle des Annales. Lamothe returned to Haiti in 1911, where he supported himself by giving piano lessons and performing in private recitals in his home, usually on Sunday afternoons (see fig. 3.1). 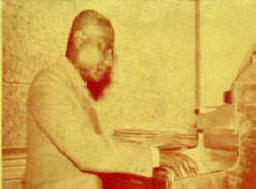 Lamothe, whose compositions were written entirely for piano, found a small but consistent audience in the piano parlors and salons of middle- and upper-class Haitian homes. He was known as the “Black Chopin” in acknowledgment of his performances of that composer’s works. On his return to Haiti, Lamothe was in great demand as a pianist and on one very special occasion, he was invited to perform in the Rex Theatre to commemorate the anniversary of the death of Frederic Chopin. For this concert, Lamothe played Chopin's famous “Polonaise in A Flat”. It should be mentioned that Chopin was Lamothe's favorite composer and it was at this event that he was labeled “un Chopin noir” (A Black Chopin). Lamothe was limited by Haitian elites' low tolerance of materials from the peasant culture, especially Vodou, yet he managed to write several works that drew upon Vodou inspiration. 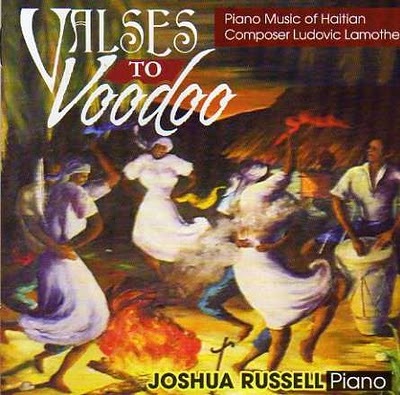 Through his efforts to incorporate lower-class musical styles, including the music of the Vodou ceremony into the classical repertoire, Lamothe engaged in what I term a “vulgarization” of Haitian music. 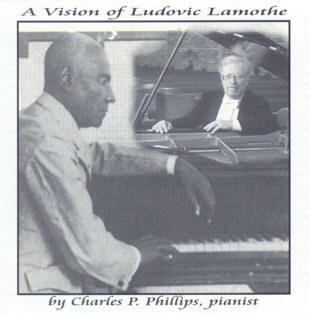 Composers such as Lamothe were working at a time when pianists expected Haitian popular music to uplift them musically and enrich them culturally; the méringue was, to borrow a contemporary term, a “crossover” genre that appealed to more than one social group. As a genre that not only served different class strata in Haiti but also allowed cross-class performance of social and political issues, the méringue was an important source of interclass contact in early to mid-twentieth-century Haiti. Lamothe's repertoire included several types of méringue, from the most formal, elite-oriented forms to the méringue of the street. On the elite end of the music spectrum was Lamothe's “La Dangereuse,” a méringue lente, or slow méringue. With its slow tempo, restrained dynamics, and gentle expressive style, the méringue lente was the preferred style of elite salon recitals. “La Dangereuse” is a typical Haitian méringue lente with its characteristic quintolet or cinquillo rhythm. In most slow méringues, the quintolet rhythm moves back and forth from treble to bass registers. In “La Dangereuse” however, the cinquillo rhythm is mostly in the left hand, giving the treble part a tranquil, vocal character (see ex. 3.2). Musicians like Lamothe performed méringues lentes in private recitals or in Sunday afternoon salons in which friends and family members insulated themselves from the pressures of everyday life in a cultured enclave. By aligning themselves with the anti-occupation sentiments of the Carnival crowds in song, Haitian elites could participate in political resistance against the occupation by performing méringues de Carnival or Carnival méringues in the privacy of their private piano parlors. Perhaps the best example of this was Lamothe's “Nibo,” which won the 1934 Port-au-Prince city council competition for the best Carnival méringue (Dumervé 1968, 247; Corvington 1987, 312). According to an article in Le Nouvelliste in 1934, “Nibo” was enjoyed by all strata of Haitian society. Like most Carnival music, “Nibo” gave participants an easily recognizable melody and several opportunities for them to punctuate the song with gestures and shouts. In “Nibo,” Lamothe eschewed the more complicated, contrasting development section of “La Dangereuse” in favor of a dramatic and endlessly repeatable musical phrase that could be easily memorized and subsequently performed by street crowds. While the musical structure of “Nibo” is unremarkable, its social and political meanings for Haitian audiences are noteworthy. The occupation of Haiti by U.S. Military forces was scheduled to end on 21 August 1934, approximately six months after the 1934 carnival. In this context, “Nibo” was understood as an anticipatory anthem for the celebration to come in August 1934. The enthusiastic reception of “Nibo” by Haitian audiences is all the more important since, unlike most popular méringues, “Nibo” was published without words. In response to his own rhetorical question posed in an article titled “Pouvons-nous avoir une musique nationale?” (Can we have a national music?) (Lamothe 1935), Lamothe turned his attention to the Haitian méringue and the songs of the Vodou ceremony. By stressing the common African ancestry of both the méringue and the Vodou ceremonial music, Lamothe believed that he could overcome the limitations each genre had as a potential national music, representing the Vodou Nation. Toward the end of his career, Lamothe was plagued with financial difficulties, and, on 9 February 1944, he was evicted from his home of more than thirty-six years. His popularity among elite music lovers prompted a fund-raising campaign. Within a few months, the fund drive raised $4,248.94, which was used to make a downpayment on another home for Lamothe (Herissé n.d.). Lamothe's precarious finances were due, in part, to the difficulty of making a living as Haiti's foremost pianist-composer. Lamothe had only two compositions published outside Haiti during his lifetime: the méringue “La Dangereuse,” published in Hamburg, Germany by Musicalien Druckerei (n.d.) and the “melodie” for voice and piano titled “Billet,” printed by Imprimerie Roeder in Paris (n.d.). Most of Lamothe's works, however, were released by the composer in Haiti and were copied and printed at his own expense. He represents the nationalist movement in Haitian classical music. A former student of the National Conservatory of Music of Paris, an emblematic figure, a piano virtuoso and a performer of Chopin, Lamothe left us a number of important compositions for piano. In his later years Lamothe was made Chief of Music of the Republic of Haiti. He died on April 4, 1953. Although during his lifetime only a handful of his works were published, in 1955 his family gathered his manuscripts and published them privately in Port-au-Prince. 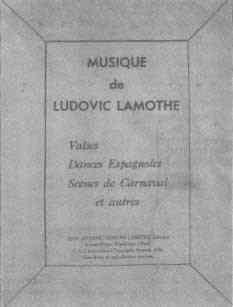 The book of Lamothe's sheet music is Musique de Ludovic Lamothe (Music of Ludovic Lamothe). It is out of print, but Suzanne Flandreau, Head Librarian and Archivist at the Center for Black Music Research, Columbia College Chicago, tells us it is available at numerous libraries via an online search tool http://www.oclc.org/worldcat/ She adds that a local librarian may be able to arrange an interlibrary loan if necessary. A Vision of Ludovic Lamothe is a recording on the IFA Music Records label, released in 2001. It features piano works performed by Charles P. Phillips, a concert pianist who specializes in the Latin American and Caribbean repertoire. The liner notes explain that the CD is a project of the Cultural Enlightenment Association of Ife. The pieces include Ballade in A Minor (Scenes de Carnaval #2) (6:17), Danza No. 1 (La Habanera) (3:27), Evocation (5:46), and Danse Espagnole No. 4 (5:15). Three of Lamothe's works are also available on Music of The Haitian Masters, IFA Music Records 256 (1999): Scherzo (5:42), Sobo (3:07), and Meringue Haitienne, La dangereuse (7:24). 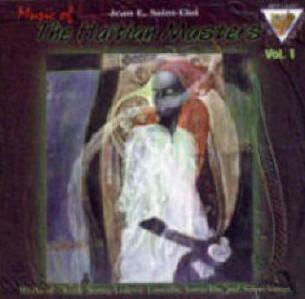 The works on Music of the Haitian Masters were all composed for solo piano, but are performed by Jean E. Saint-Eloi on MIDI guitar. The other Haitian composers whose works are included on the CD are Justin Elie (1883-1931), Occide Jeanty (1860-1936) and Solon Verret. They are profiled at this website as well. CD: Voix et Tambours d’Haiti; Emile Desamours, conductor (1999; Bouquet Créole des nos Vingt Ans). Billet, for medium voice & piano. Paris: n.p. [?]. Danza, piano, no. 4 (1953). Port-au-Prince: Jean, Antoine, Ferdinand Lamothe, 1955 (Valse, danses espagnoles, scènes de carnaval et autres). LP: Ruth Norman, piano. Opus One 39 (1978). CD: Paul Shaw, piano. (Le grand tour; Paul Shaw plays Caribbean art music). 78rpm [? ]: Victor; Ludovic Lamothe. La dangereuse; Meringue haitienne, for piano. Bruxelles: Mahillon. 78rpm [? ]: Victor. CD: Jean Ernst Saint-Eloi, guitar, MIDI realised. (1999; Music of the Haitian masters, vol. 1). Nibo, Merengue de carnaval, for piano. New York: [n.p.?]. Papillons noirs, for piano. Bruxelles: Mahillon. Retraite aux flmbeaux, for orchestra. Arr. By John Jost. ---- for guitar, arr. by Frantz Casséus. LP: Frantz Casséus, guitar. Folkways FP-811 (1953). Sous la tonelle, for orchestra. Tango, for piano. Port-au-Prince: Jean, Antoine, Ferdinand Lamothe, 1955. Library: Library of Congress. Valses, danses espagnoles, scenes de carnaval et autres, for piano. Port-au-Prince: Jean, Antoine, Fernand Lamothe, 1955. Library: Library of Congress. No. 1 en sol majeur. Dauphin, Claude. Notes pour l’audition de Ludovic Lamothe, Claude Dauphin, Edouard Wooley, Justin Elie, Werner Jaegerhuber, Michel-Étienne Descourtilz, Robert Durand, Carmen Brouard. Montréal: Société des Recherche et de Diffusion de la Musique Haitienne, 1979. 11p. Largey, Michael. “Lamothe, Lucien” in International dictionary of Black composers, ed. by Samuel A. Floyd, Jr. Chicago: Fitzroy Dearborn, 1999, v2, p710-713. Southern, Eileen. “Lamothe, Ludovic” in Biographical dictionary of Afro-American and African musicians. Westport: Greenwood Press, 1982, p237. (The Greenwood encyclopedia of Black music).